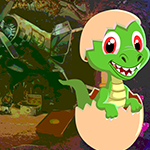 G4K Baby Dinosaur Rescue is another point & click escape game developed by Games4King. There were a few houses in a huge dark area. Some bad people kept a baby dinosaur in a house there. It is your duty to save the dinosaur from the house by finding hidden clues and solving puzzles. Good Luck and have fun! Wow, great long game. Thank you!